The Glow Up is about artistry, community, good vibes, cherished moments, and creative self expression... We do this for the CULTURE!! If you love dancing, music, good vibes, art, good drinks, food, and fun, this is the event for you! 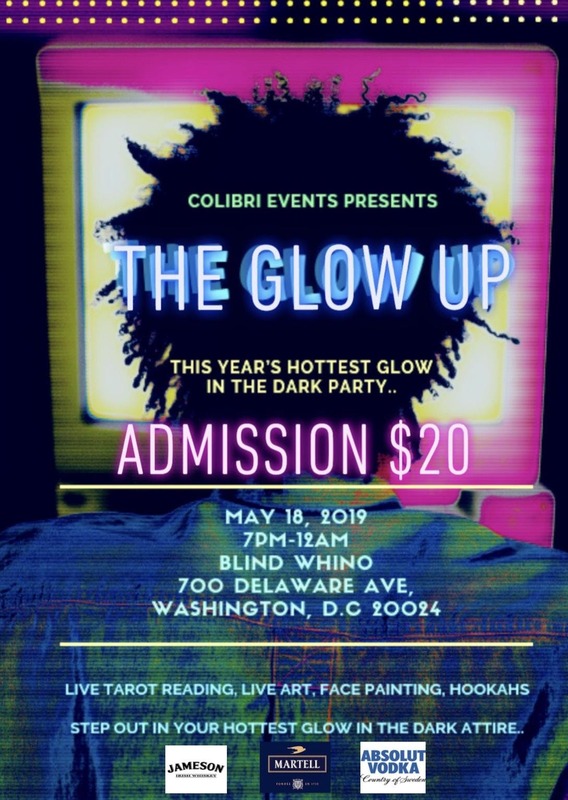 Come joint us for this years HOTTEST Glow in the Dark Party known as "The Glow Up" for the culture. This event will be lit, LITERALLY! Featuring Live Tarot Reading by the one and only Krystal Banner, illustrator/author of Kaleidadope Tarot. First (3) readings are FREE! There will be Live Art, Live Glow in the Dark Graffiti Painting, Live Glow in the Dark Canvas Painting, and Glow in the Dark Face Painting. ENJOY OUR $8 Featured Cocktail "The Glow Up"
This is a "TICKET ONLY EVENT"